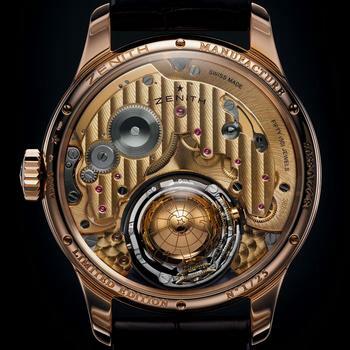 Zenith (previously mentioned) has come out with an updated version of their Christophe Colomb watch, the only watch with a gimbal-mounted balance. 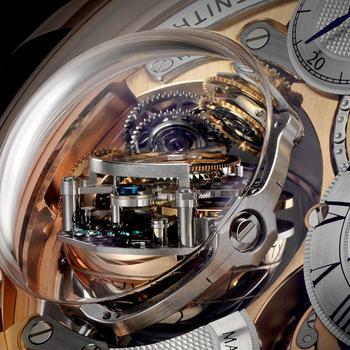 Their idea was to let the gimbal keep the balance wheel in a constant position, and adjust it there, rather then letting a Tourbillon average out different positions, and they thought it looked cool. 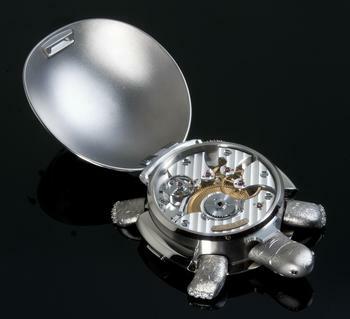 They've skeletonized the dial and crammed a fusee and chain into the movement. I have no idea how they managed to cram that fusee in there, but it does make sense in the context, since it's most commonly seen in marine chronometers. Technically it's something of a tour-de-force, one of the few modes of regulation that has no direct competition, and the domed sapphire IS quite cool looking. 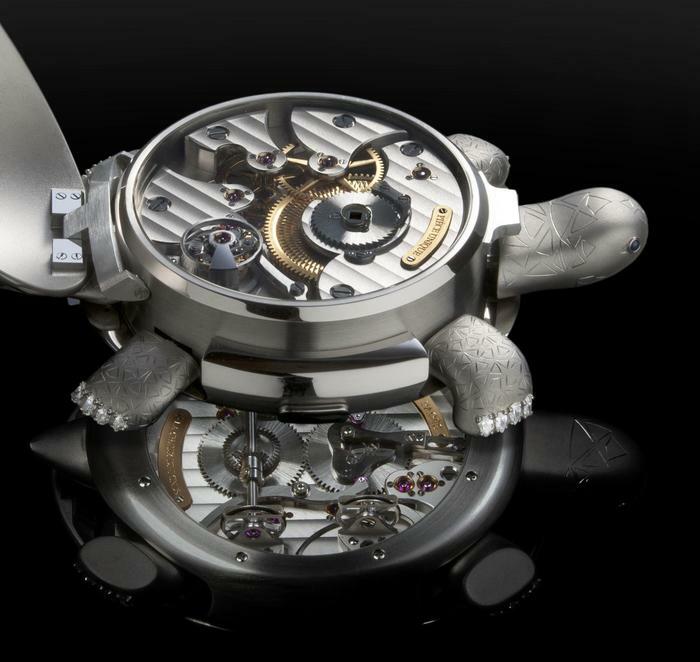 Functionally, it's a massive brute of a watch, bigger then most Pannys. 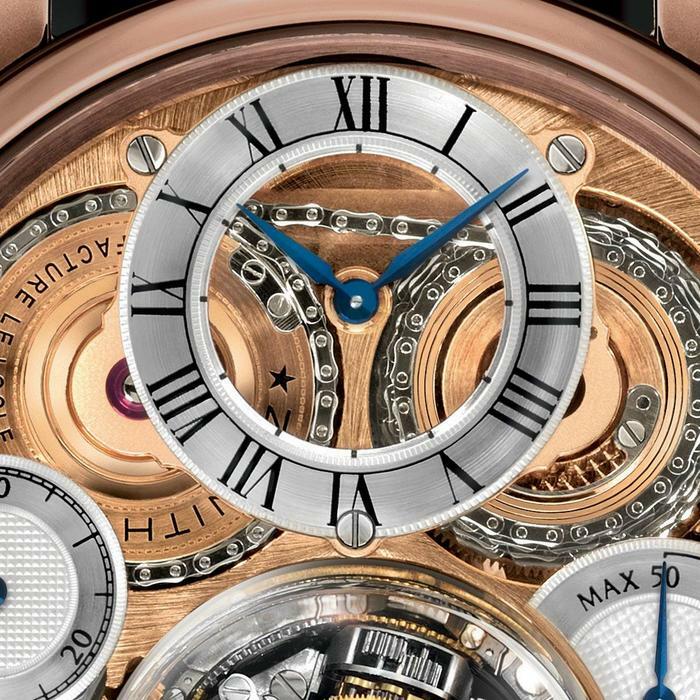 The case, in 18kt rose gold, measures 45mm x 14.3mm (21.4mm counting the sapphire glass extrusion for the gravity control cage, and it is water resistant to 30 meters. Movement is the Swiss manual-wind Zenith in-house caliber El Primero 8805 with 53 jewels, 36,000 vph and a power reserve of 50 hours. 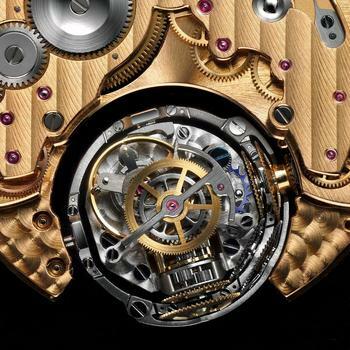 The movement is comprised of 939 parts, with the gravity control module having 575 parts. 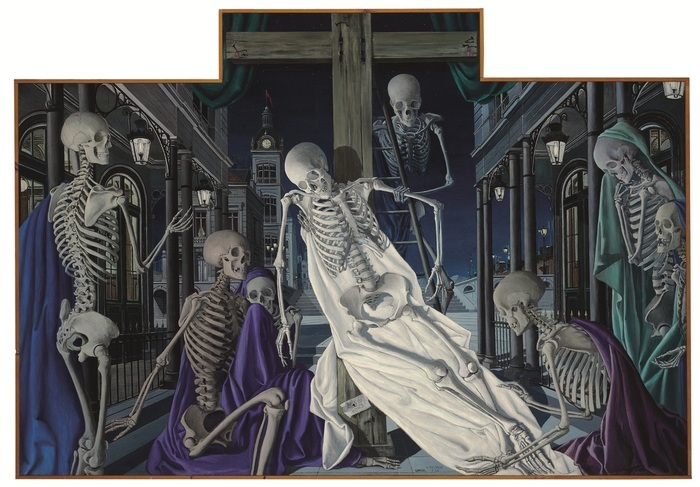 Because I like, conceptually, the various modernest takes on the common tropes of European art, here's Ecce Homo, in altarpiece-shape even, from Paul Delvaux. Now interestingly, it's not the right form to be an Ecce Homo painting, and is properly subtitled The Descent from the Cross, but I wonder if the misnomer had some sort of meaning to the artist...oh those wacky Belgians. 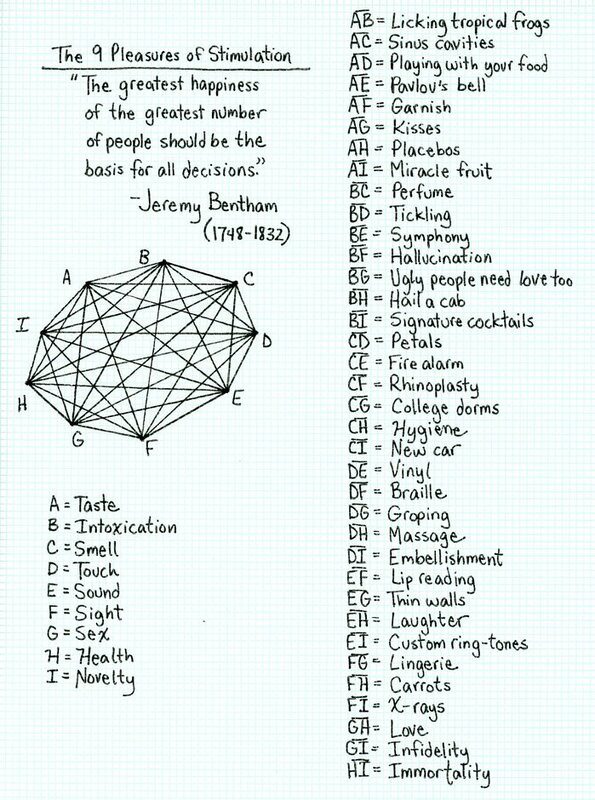 If you've got the cash, it's for sale in Christie's Feb 2013 auction, The Art of the Surreal. Clockwork-powered automatons(see previous) were quite the rage in the late 18th Century, Jaquet Droz, both the man and the house, were quite famous for them. But fashions change and with the exception of a brief revival in the house of Faberge, they've not been made in the 200 years since. 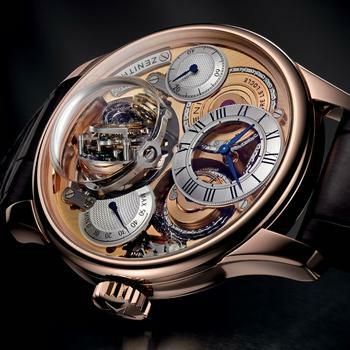 All of that has started to change in the last five years, JD commissioned a fully-functioning Time Writer (patterned on the Writer, one of the three immensely complex Android-style automata made by their namesake), and now Raul Pagés has started his own brand dedicated to them. His first product is more along the lines of Faberge, a small tortoise which, when wound with a key, walks across a table, craning its neck from side to side. 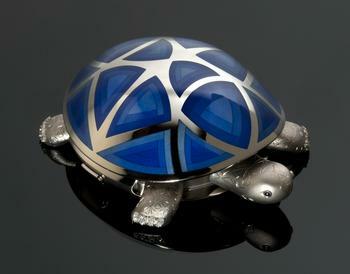 Each one will be unique, the first one has a 18kt white gold shell with blue enamel and diamonds inset as toenails. 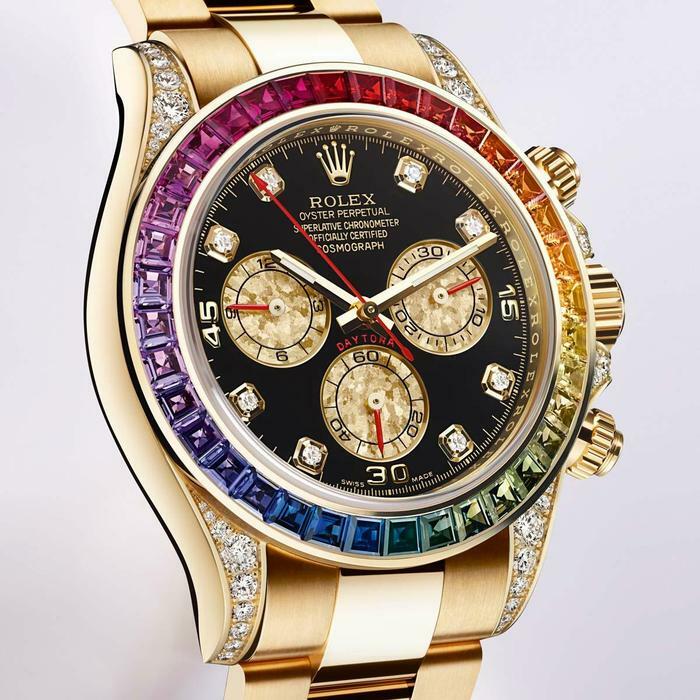 When you need to scream "I HAVE GOOD TASTE"
It's a regular daytona inside (40mm case, 100m WR, 4130 caliber movement with 44 jewels, 72 hours and 28,800 BPH). Outside the case is 18kt yellow gold set with 36 sapphires (the rainbow bezel) and 36 diamonds (the lugs), with an additional 8 diamonds on the dial. making ALL food a bit British, EVERY DAMN PLACE has fish and chips, et al.